Following the vote for Brexit, there was a remarkable sense of speechlessness, especially among British “Remainers.” The mostly negative debate about the consequences was countered in a creative way by the acclaimed British design and architecture website Dezeen. They approached Brexit in a playful manner, asking their readers to create a new passport design for the UK to replace the maroon EU passport. The contest seemed to have its finger on the pulse, being featured by BBC TV and British national newspapers such as the Daily Mail, The Telegraph, The Guardian, and the Evening Standard. Marcus Fairs is founder and editor-in-chief of the design website Dezeen. He is an award-winning journalist and author focusing on architecture and design, and was the first blogger to be awarded an Honorary Fellowship of the Royal Institute of British Architects. He is said to be among the 100 most influential figures in the UK creative industries. In the end, about 200 passport design concepts were sent to the Dezeen headquarters in London, where a jury of design experts made a critical appraisal of all of them. Alongside Marcus Fairs, the jury included The Guardian architecture and design critic Oliver Wainwright, director of the London Design Museum Deyan Sudjic, graphic designer Margaret Calvert, and Anita Taylor, dean of Bath School of Art & Design and chair of The Council for Higher Education in Art & Design. The participants were mostly designers, but also students and amateurs. They hail from 30 countries; the youngest participant is 12, and the oldest 83. Many of the works reflected the Brexit vote in one way or another. 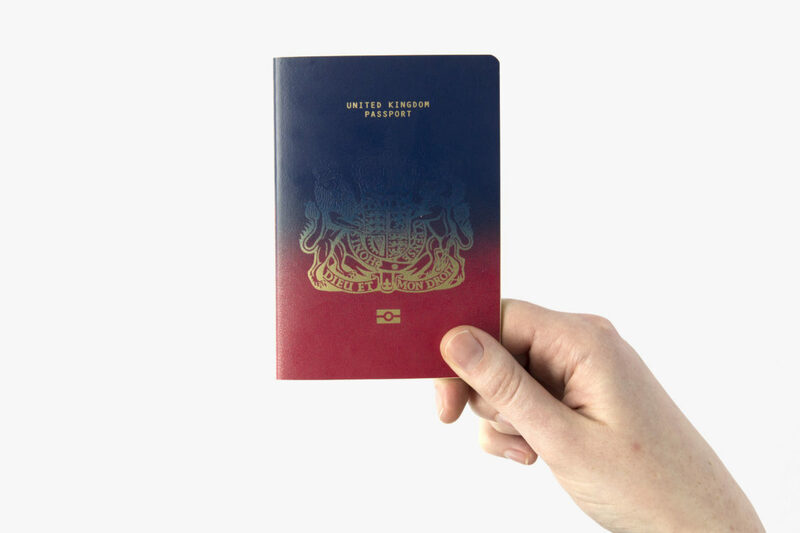 Playing with the result of the vote, one entry for example blended the old British passport and the current one: 48% of the cover depicts the maroon EU passport design and 52% the old blue British passport design. One extremely playful approach is the shimmering passport that can be worn as a neck pouch. According to its creator, it is meant both as an official document and as an eye-catching conversation starter. For the latter, the designer added some basic conversation phrases inside, in languages from all over the world. Some proposals clearly showed the creative frustration of “Remainers” regarding the Brexit vote – some more subtle, and others in quite an explicit way. Yet others focused more on nature, the landscape, and the sea. A Norwegian designer played with the rainy weather, featuring a rainy grey cover and visa pages illustrated with weather reports, rain, snow, and sun. Another example based its design on visualizing geological data from the UK. For a more in-depth look at the range of design works, as well as the winner, please visit www.dezeen.com.